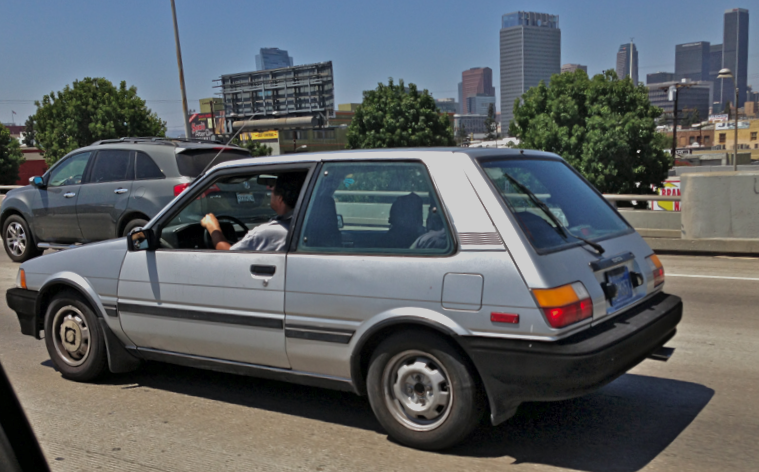 Seems as though there’s an automotive anniversary noted daily. 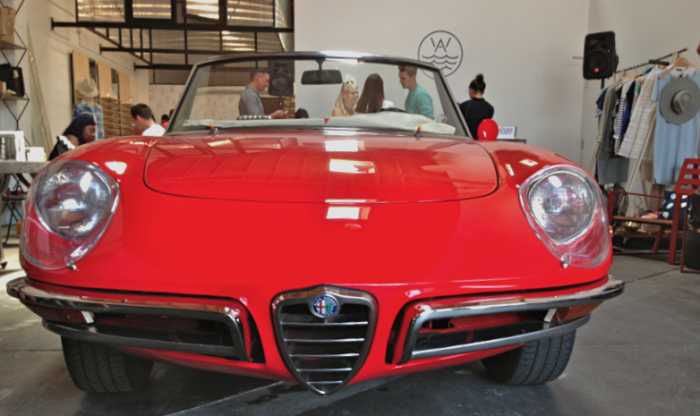 We told you about the 50th anniversary of the closing of Studebaker’s South Bend plant a few days ago and just got word that 2014 is the centennial of Maserati’s founding. Today’s news is that Chevy’s El Camino was introduced 55 years ago. Chevrolet was caught blindsided when Ford launched its Ranchero in 1957. 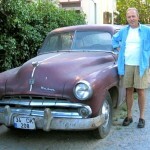 It was a truck, carved out of a Ford station wagon, offering the utility of a pick up and the comfort and style of a car. Chevrolet responded with the ’59 El Camino, an adaptation of the truly bizarre Chevy of that year, complete with bat wing rear fenders. After the 1960 model year, Chevy abandoned the market but came roaring back with a Chevelle-based incarnation of the El Camino in 1964 and stayed with it for the next 23 years. 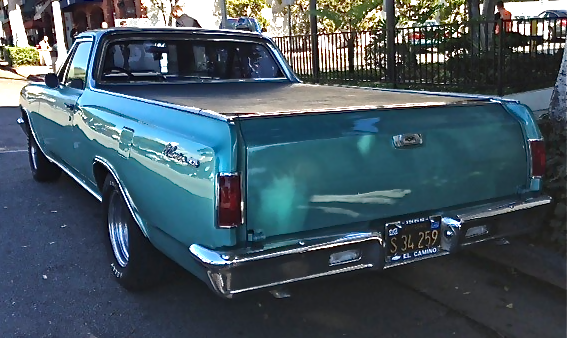 Feral Cars scout Lynda Keeler found this very glossy tourquoise ’67 with jaunty load bed tonneau cover and très cherchez California “black plates.” Sweet! 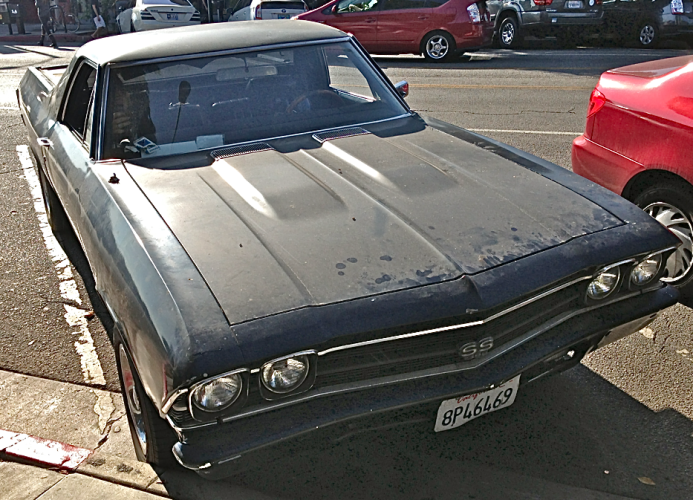 Because they’re actually trucks, El Caminos aren’t necessarily babied as with this beastly SS396 from 1969. Prepare to roll up your t-shirt sleeve and insert a pack of Luckies. An alternative to both high gloss and beat down looks is this pebble finish treatment that is, with apologies to Ike and Tina Turner, both nice and rough. End of the line Elco: when it works, it works hard. El Camino production ended in 1987 as standard pick up trucks, like Chevy’s own C/K, offered more amenities with interiors as plush as many upmarket passenger cars. 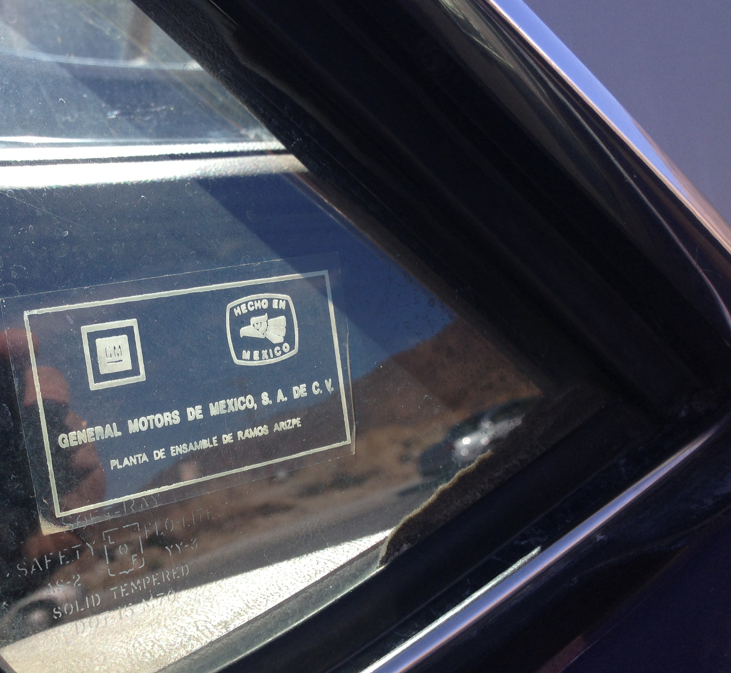 Production of the last generation El Caminos shifted south in 1985, as evidenced by this “Hecho En Mexico” window sticker. 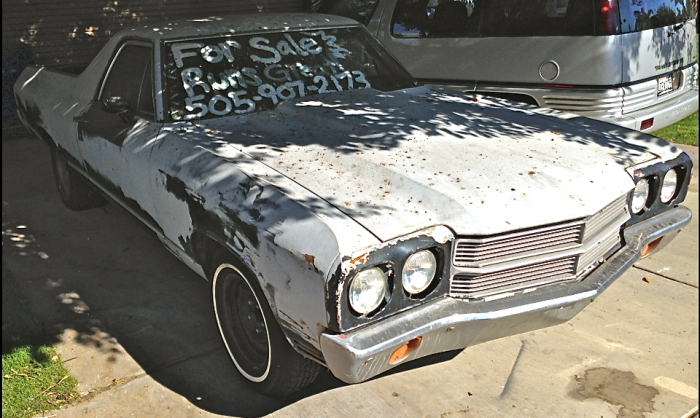 Despite the fact that El Caminos are no longer built, one can certainly find many, many used examples, in varying states of repair from which to choose such as this “pre-owned” cream puff. “Runs Great” says it all! OR you can build your own out of a cast off passenger car. We especially like this nifty little green “Beameramino,” cobbled together from an early 70s BMW 2002. 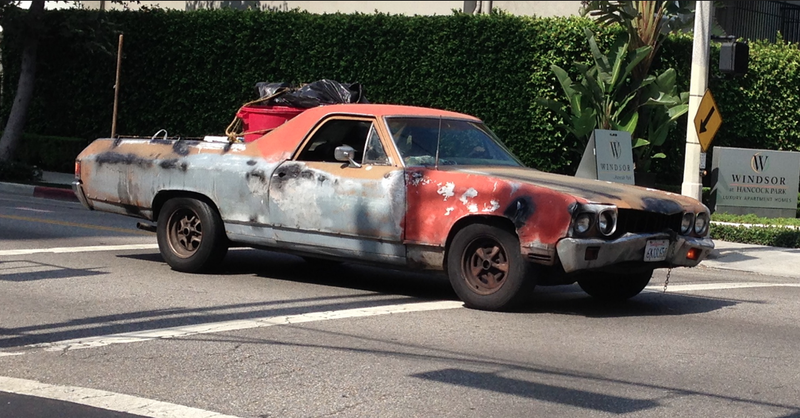 Every now and then there’s a rumor that GM will start building the El Camino again and that’s because so many have fond memories of these trucklettes. 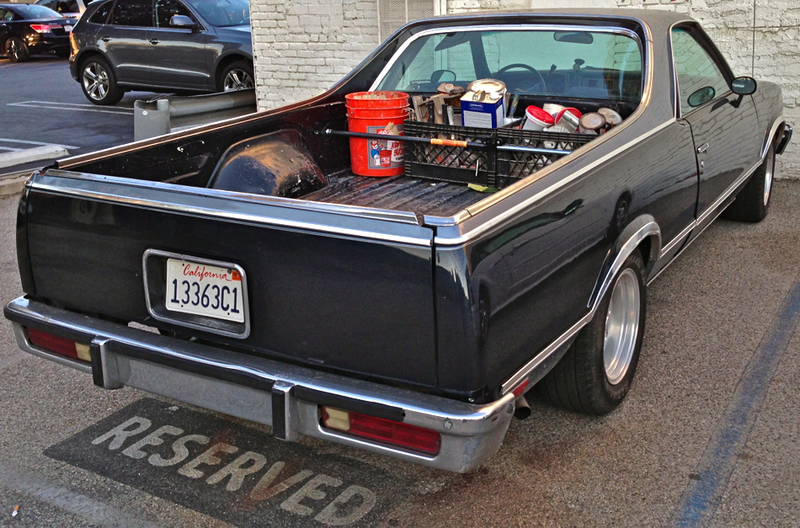 No less a light than the 42nd President of the United States, William Jefferson Clinton, admitted to owning an El Camino. 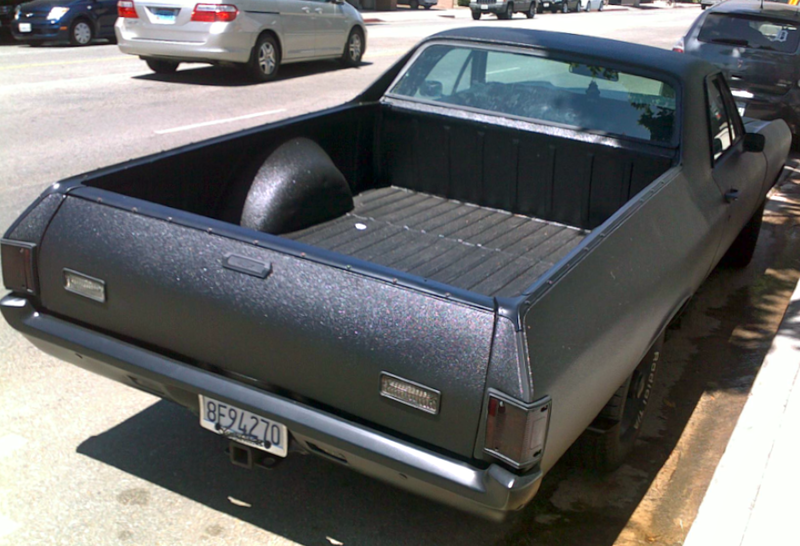 In a 1994 speech before an audience of GM plant workers in Shreveport, LA he famously noted, “I owned, when I was a younger man and had a life.. an El Camino pickup in the seventies. It was a real sort of southern deal. I had Astroturf in the back. You don’t want to know why, but I did.” Astroturf? That must have been so he could practice his putts, right? 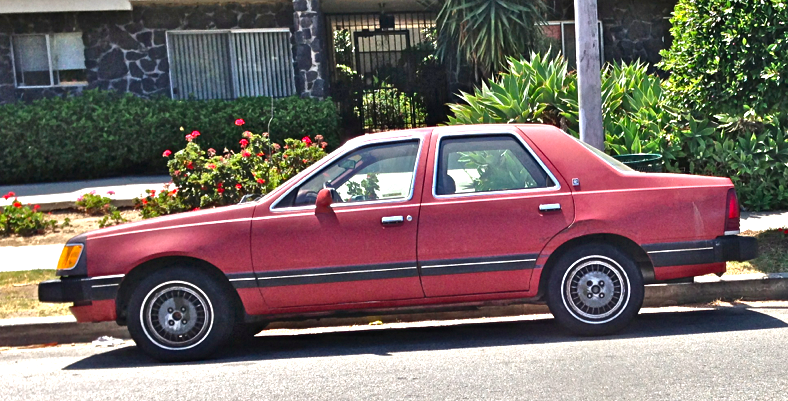 More recently, groovy rockers The Black Keys released an album entitled “El Camino” but, inexplicably, it featured a mid-1980s Plymouth Voyager minivan on the cover. 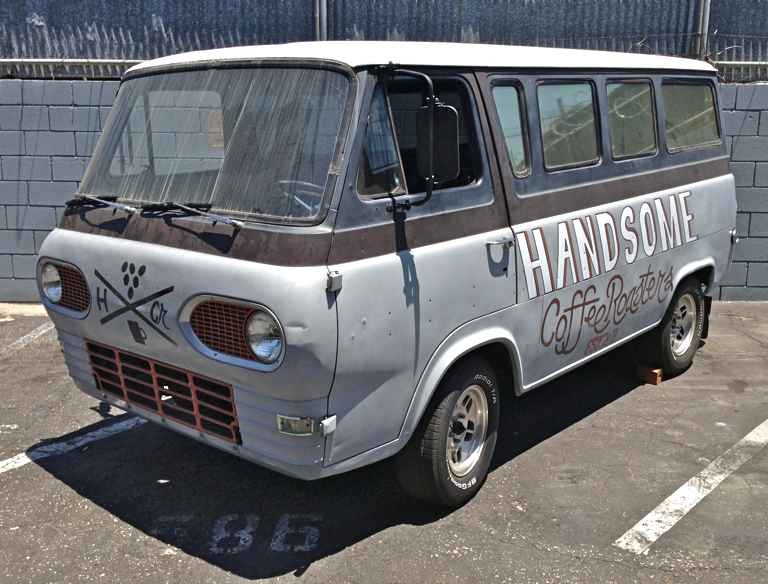 Yes, those nutty hipsters sure know how to blow your mind! Country music great Tom T. Hall was El Camino’s spokesperson when the truck was downsized in the 1978 model year. In this commercial he makes smaller seem better. He’s the composer of many celebrated songs including “Harper Valley P.T.A.” and “I Love,” the latter of which includes the verse “I love I little baby ducks, old pick-up trucks / Slow movin’ trains and rain.” Our version would be “I love Babe, the Bambino and El Caminos/crazy old cars and bars.” Yes, the never-to-be-forgotten Chevy El Camino was poetry in motion. If you’ve stalked a feral car and would like to submit a photo of it for posting consideration please send it to us: info (at) feralcars (dot)com OR through our Facebook page. Include your name, location of the car and some thoughts about the vehicle and we’ll look into getting it the attention it deserves. 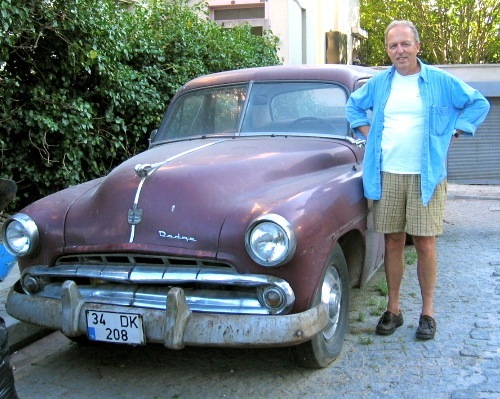 This entry was posted in BMW, Chevrolet, El Camino, Ford, Ranchero, Uncategorized on 12/13/2013 by feralcars.